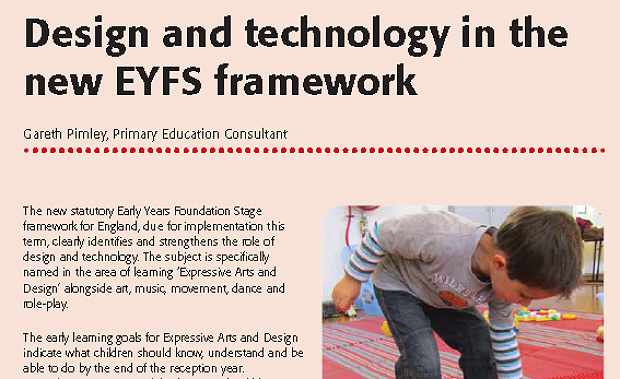 The statutory framework for Early Years Foundation Stage was introduced in September 2012, and clearly identified and strengthened the role of design and technology. D&T was named in the ‘Expressive Arts and Design’ area of learning alongside art, music, movement, dance and role-play. The early learning goals for Expressive Arts and Design indicate what children should know, understand and be able to do by the end of the reception year. A significant proportion of this learning should be delivered through high quality D&T, enabling children to ‘safely use and explore a variety of materials, tools and techniques, experimenting with colour, design, texture, form and function’ and ‘use what they have learnt about media and materials in original ways, thinking about uses and purposes’. 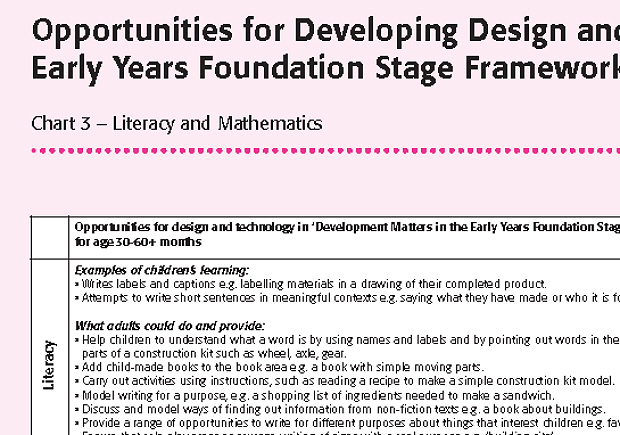 This resource includes four charts developed to help identify opportunities for D&T, drawing on non-statutory guidance for EYFS. These suggest what children might learn, what adults could do and include notes on effective practice. Examples have been added or amended to indicate relevance to D&T. The charts focus on opportunities in Expressive Arts and Design; Understanding the World and Physical Development; links between D&T and Literacy and Mathematics; and Personal, Social and Emotional Development and Communication and Language. Also included is a PowerPoint presentation ‘D&T in the new EY framework’ which acts as a guide to how the framework will operate and how D&T fits and can be effective within it. This resource was first published in September 2012 as part of D&T Primary magazine and the accompanying article is also included.